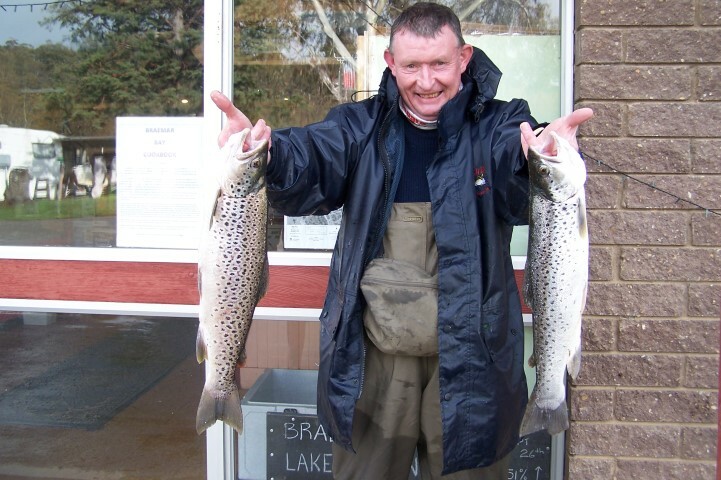 Fly fishing has Improved over the last few weeks with some good results coming from Braemer Bay and Middlingbank, Buckenderra and seven gates. Good reports on the rainbows and browns with most fish getting caught around all the gully areas best flies are woolly buggers and nymphs let them drop retrieve slow. The long weekend had been a little hard with all the wind and rain most fishers looked for cover and I’m sure that was at the pub!! So all reports have been good things are starting Improve the lake is filling up and the rainbows and browns are biting. Best flies are Woolly buggers, Nymphs and Black and Brown Muddlers. 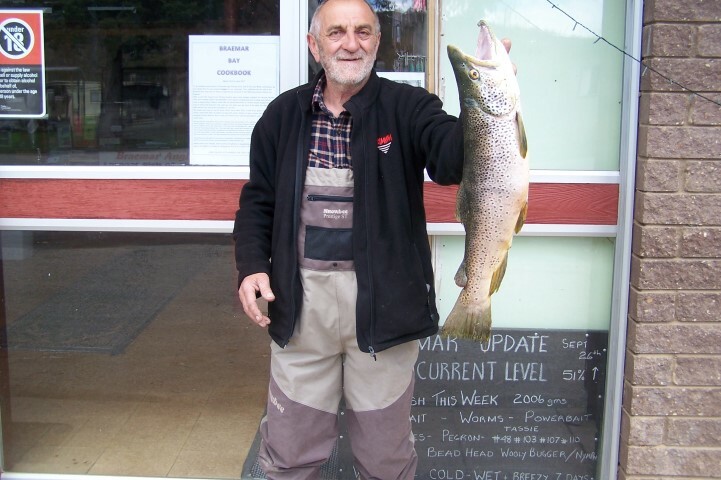 Most fishing has been good around the lake with good results coming from Kalkite, waste point, poo Bay, Hayshed Bay. Like Eucumbene look for the gully areas where the water has been running into to that’s where the foods is again nymphs and woolly buggers have been good we did get some reports the fish have been eating frogs so one fishermen tried a frog pattern on top coming out with some good results so if you have any green floating foam patterns think it might be worth a go!! Overall jindy is ok yes ok not good let’s see what happens when the wind goes. Most rivers have been running to high to fish over the long weekend so the fishing was hard but what i seen was the die hard fishers out and about but the results was not that good. So let’s hope thing will improve and the rain stops along with the wind the rivers are looking good and I’m sure they will fish well once things calm down. 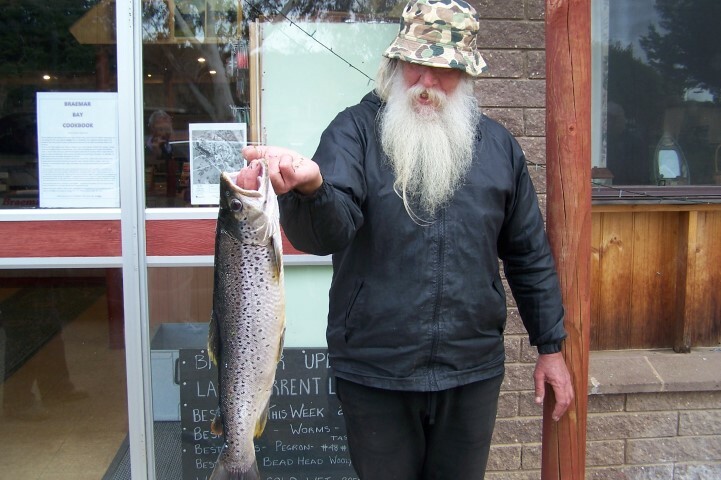 Peter from Braemar with a fishing report for the week ending October 2nd 2016. The lead up to the long weekend proved to unpredictable and challenging with the weather once again limiting opportunities to fish and of course the fish proved to be a bit elusive, conditions ranged from very poor to downright disastrous as wave after wave of cold fronts made their way across the Lake accompanied by gale force winds and rain, when the weather did clear up for a day or 2 anglers were out and about with some doing very well and others having no luck at all. Worms continue to best the most reliable method with some very nice fish caught and landed, Steve Roberts and his son Oliver made the trip up from Melbourne and were into the action straight away with a nice kilo plus Brown caught by Oliver, Daryl Suckley caught his best Brown ever in Andy’s Inlet on powerbait, Daryl also managed several nice Browns during the week with his side kick Max also getting amongst the fish every now and then. Val and Venny Wezinow had mixed results trolling and bait fishing whilst their son Gen drew a blank, Eric Dennehy had a great start to his trip bagging 2 beautiful Browns of 2kg in no time at all and managed another couple around the kilo mark trolling and bait fishing with worms, best area’s for Eric were middle Braemar and Jock’s Cove , Jeff Hall had a great trip catching 18 fish over 3 days meandering around in his canoe and using his home made lures, at the other end of the scale the Wright Gang and the Dodsworth brigade had a poor long weekend. Peter and Bobby from Ventnor had a great mini session landing 2 nice browns close to 2kg using nymphs and Ben Tickle as usual got his 2kg Brown on his home made mudeye imitation, but the fish of the week came from Peter Giles who managed a 3kg plus Brown on a beige nymph, this fish was 67cm long but in very poor condition, quite possibly just back from spawning duties, hopefully it will regain condition quickly and be around 4.5kg mark it should be at that length. 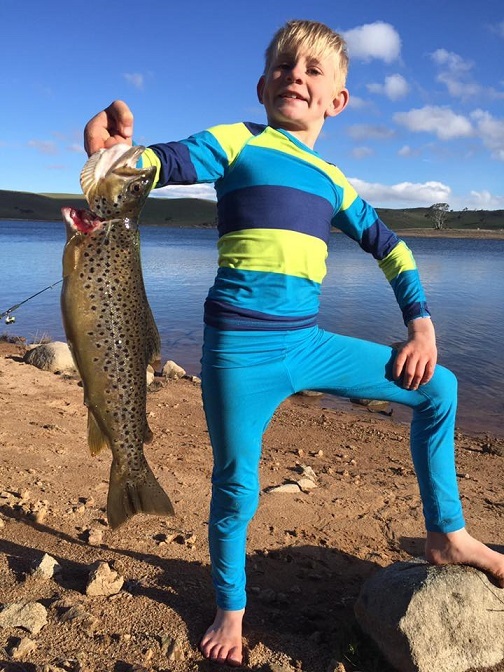 The Sheehan group from Victoria arrived at the weekend and were quickly amongst the fish using bait and trolling, best results so far are from Ian with a 2.2kg Brown and Leo who pipped him at the post Monday morning with a 2378 gms Brown on worms. The wild and wet weather continues at Braemar and the forecast is not so good for the coming week, at least all this rain is keeping food at the bank for the cruisers and the run off is making sure the Lake level continues to rise rapidly, I know its easy for us to say from the comfort of our lounge rooms, but the fishing can be very very good in rough conditions like we are experiencing now, rug up with protective gear and enjoy the results from bait fishing, trolling o course is usually out of the question, fly casting can also bring results if you can find a spot out of the wind amongst the margins, the fish are there right now. Pictured are Daryl Suckley with his 2268 gms Brown, Leo with his 2378 gms Brown, Eric Dennehy with his fine Browns. Took the kids to Jindabyne on Wednesday for a camp out. 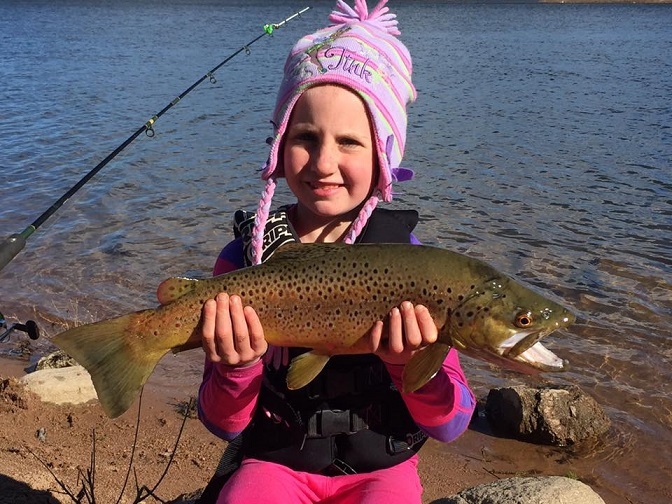 Bad weather on Thursday sent us home early but not before the kids each caught a nice Brown Trout. 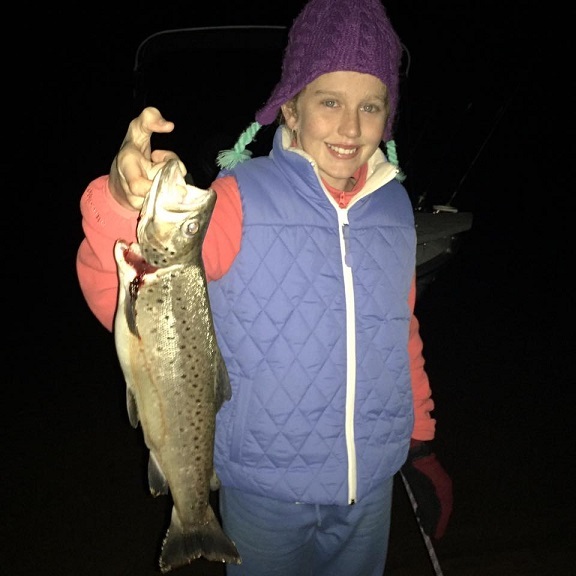 Jess my eldest caught hers at night on a yabbie we caught after she spotted it walking the edge of the water line. Lochie and Tilly caught theirs at Creel Bay on worms. Tilly's fish going 54cm and was caught in the same spot as her Rainbow only a couple of weeks earlier. Our total being 4 Browns before we pulled the plug and left the weather behind.